The CBMS Research Program generally aims to provide a regular source of necessary data for evidence-based policy making, program design and implementation, targeting, and impact monitoring overtime. CBMS has been developed and pilot tested in over 29 countries in Africa, Asia, and North and South America. Read more in the CBMS Brochure. The CBMS Network Office, based at the De La Salle University- Angelo King Institute for Economic and Business Studies (DLSU-AKI) in Manila, provides technical and capacity building support for the development and implementation of CBMS in the Philippines since 2000, and globally since 2002. The CBMS Network Office (formerly known as MIMAP-Project Management Office) is led by Dr. Celia Reyes, who developed the CBMS methodology in 1993 under the Micro Impacts of Macroeconomic Adjustment Policies (MIMAP) Program supported by IDRC-Canada. In partnership with PEP, the CBMS Network Office since 2002 to present provides technical and capacity building support to country project partner institutions for the development and application of the CBMS methodology for poverty analysis and other thematic concerns. Under the PEP collaboration, the CBMS Network Office (also referred as the CBMS Network Team), conducts specialized CBMS capacity building modules for CBMS country project partners on: (a) Design of CBMS methodology and data collection instruments; (b) Development of Indicator Systems for poverty monitoring; (c)Using CBMS for Gender Responsive Budgeting; (d) Generating multidimensional poverty index using CBMS data; (e) Implementing the CBMS Accelerated Poverty Profiling (APP) tools for tablet based data collection; (f) Processing of CBMS Indicators Using Stata; (g) Generating SDG indicators Using CBMS data; and (h) Poverty Mapping using CBMS-QGIS. The Community-Based Monitoring System (CBMS) Network is part of the Partnership for Economic Policy (PEP) Network. Launched in 2002, with support from the International Development Research Centre (IDRC)-Canada and the Canadian International Development Agency (CIDA), the CBMS International Network generally aims to assist its members develop, refine and institutionalize community-based monitoring systems in developing countries, and to promote CBMS knowledge and initiatives internationally. Furthermore, the Network promotes evidence-based policymaking, program design and implementation while empowering local communities to participate in the process. From 2007-2012, in addition, further developments in the CBMS program of activities were likewise supported by the Australian Agency for International Development (AusAId), and the UK Department for International Development (UK Aid). The CBMS Network organizes 15th CBMS Philippines National Conference/CBMS International Network Policy Conference on "Localizing the SDGs through CBMS" on March 13-15, 2019 at the Novotel Manila Araneta Center, Philippines. Download the CBMS Brochure to find out more about how it can be used in designing poverty reduction initiatives, improving local governance and monitoring the SDGs. DILG issues memorandum circular on the guidelines for the implementation of CBMS under DILG-Bottom-Up Budgeting Fund FY 2016. Click here to see the MC. See the DILG Memo circular issuance (July 2015) here advocating the adoption of CBMS in the Philippines. CBMS Network launches the CBMS Accelerated Poverty Profiling (CBMS-APP)! Read here for more details. Be informed about CBMS-Philippines by downloading the 2018 FAQs here! A briefer about the use of CBMS in Disaster Risk Reduction Management, get it here. DILG-MC on Use of Local Disaster Risk Reduction and Management Fund for implementation of CBMS. Click here to download. Use of CBMS for bottom-up planning and budgeting (Joint DBM-DILG-DSWD-NAPC Memo Circular). Please follow this link. Moreover, the Network had also supported the dissemination of related CBMS initiatives under other IDRC national projects in Senegal, Nepal, and Sri Lanka. CBMS is one of the tools developed in the early 1990s to provide policymakers and program implementers with a good information base for tracking the impacts of macroeconomic reforms and various policy shocks. It is an organized way of collecting information at the local level for use of local government units, national government agencies, non-government organizations, civil society and development partner agencies for planning, program implementation and monitoring. CBMS attempts to build and strengthen the capacity of planners and program implementers at the national and local levels for an improved and more transparent system of resource allocation and governance. A major objective of CBMS is to assist in poverty reduction. In so doing, there are other corollary benefits achieved like building the capacities of local government units, increasing gender equity, and eliciting early warning signs of crisis. Due to the growing number of countries that implement and intend to implement the CBMS, a regional coordinating body tasked to facilitate the development and utilization of the CBMS for policymaking and governance was created. This coordinating body is now known as the CBMS International Network Coordinating Team. Through a competitive CBMS research grants program managed by the PEP-CBMS Network Office based at AKI-DLSU in Manila, the Network provides funding of up to US$ 50,000 to national or local institutions in developing countries for varying phases of CBMS work. Support provided to CBMS research partners extends to their participation in various PEP-organized capacity-building workshops as well as in international policy fora and conferences, dissemination of country project findings in PEP publications and website, and peer-review of on-going research work. The Network provides support for the dissemination of findings of research partners through the organization of national and international policy conferences, general meetings, and workshops. These activities are deemed vital in disseminating the findings of the research network to its stakeholders and getting feedback, fostering technical collaboration with current research and development partners, and in establishing linkages with new partners. CBMS policy conferences focus on the dissemination of research findings with regards to emerging development issues and concerns. Earlier conference tackled issues and findings relating to localizing the millennium development goals, improving local governance and accountability, and in scaling up poverty reduction initiatives. Workshops on the other hand involves interactive lectures, discussions and hands-on training exercises on topics relating to multi-dimensional poverty analysis, panel data analysis and poverty mapping utilizing methodologies and instruments developed under the CBMS Network. These activities are intended to further build capacities of researchers in refining their on-going CBMS work. PEP through its PEP-CBMS Network Office based in Manila supports the preparation, publication and dissemination of a quarterly newsletter of the CBMS Network. The newsletter features highlights of recent research findings of CBMS country projects, snapshots of completed, on-going and upcoming network activities. In addition, technical and financial support is provided by the network for the publication of CBMS books, brochures, posters, and poverty maps. The network also supports the development and maintenance of the PEP-website (www.pep-net.org) which stores CBMS-related references and updates on the activities of the Network and facilitates sharing of information among network members and to the general public. Work is on-going for the development of the on-line CBMS-poverty database. The dissemination of lessons learned, good practices, and findings on the implementation and use of CBMS by research partners and stakeholders are also done through video documentation. To date, videos on the CBMS experiences in the Philippines and in Bangladesh are now accessible to the public on-line through the PEP web-site. Networking is a vital component of the PEP work agenda. Over the years, the PEP-CBMS Network Office has collaborated not only with research and academic institutions but with national and local stakeholders and international development agencies in the conduct of its research activities. These collaborations have not only ensured that the PEP-CBMS research addresses emerging development concerns and issues but has likewise generated financial contributions and advocacy support for scaling up CBMS initiatives within developing countries where CBMS is being implemented. Part of its networking activities, is the provision of technical assistance to government and non-government institutions, individual researchers and other interest groups concerned with the development and institutionalization of local monitoring systems for tracking poverty and other related applications of CBMS. Technical support of the Network ranges from the conduct of a series of orientation seminars, lectures and hands-on workshops on CBMS data collection, processing and analysis, poverty mapping and data-base building, post-workshop mentoring/coaching on CBMS related research initiatives and applications until the dissemination of CBMS-related findings and policy recommendations. Since 2002, PEP-supported CBMS research initiatives have resulted to the development of local poverty monitoring systems, up to date and more disaggregated and useful data for poverty analysis, and steered greater participation of local stakeholders for needs-responsive program design, more focused targeting. Furthermore, said projects also provided avenues for the development of improved mechanisms for impact–monitoring and evaluation of various poverty reduction programs and development initiatives. CBMS work has complemented the growing demand for local poverty statistics from various stakeholders (e.g. national and local planners, members of the academe and the research community, and development partners) in many developing countries particularly to improve poverty reduction initiatives, and to monitor poverty conditions of various sectors overtime. With the data generated from the local monitoring systems developed and refined under PEP, developing country researchers were able to empirically show the great potential of local level statistics as a vital tool in the design of poverty reduction programs, targeting of its beneficiaries and in program-impact monitoring. The CBMS Network's research initiatives were able to illustrate the importance of the customization of research methodologies in the context of the existing institutional arrangements and emerging issues within developing countries as well as involvement of key stakeholders in the process of the development of the tools to better influence policymaking and program implementation. Or download it here (MPG). 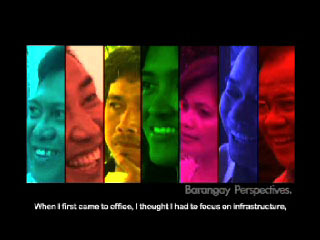 Watch the CBMS Advocacy Videos here.